Wearing a stunning red jeweled gown, Marilyn Monroe's wax figure is poised and ready for a close up with you! She was born on June 1, 1926 in Los Angeles, California. 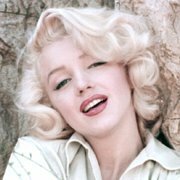 She almost chose the stage name Jean Adair before settling on Marilyn Monroe. She was quite the chef and liked to cook.